There are four ways to enter. You may not enter more than four times. Please leave a separate comment for each entry. Please include your email address if your profile does not offer that information. The first way to enter this contest is to visit BuyGreen.com, and leave a comment telling me which of their products is your favorite. A third way to enter is to follow BuyGreen.com on twitter. Simply leave a comment letting me know that you follow them. Lastly, you can enter this contest by becoming a fan of BuyGreen.com on facebook. Make sure to leave a comment letting me know you did this. Contest ends on Friday, May 15th at noon (EST). I like the Socktopus. He's so cute! I love the Sweater Monkeys-but actually I am so glad I saw your tweet. I am bookmarking that site and hope to buy some products soon. Thanks so much for sharing! Just followed BuyGreen.com on twitter-thanks again! Besides that cute sock dog, I like the SIGG 0.6L Water Bottles. I would love to win this- so cute! My favorite thing besides the doll kits is the Blooming Lotus Body Shampoo. That just sounds wonderful for the body! I'd like to try their Blooming Lotus Herbal Salve on my baby's red bum. My favorite is the monkey! Ella must have one!!! I like the Peace Bracelet! I love the sweater owl! 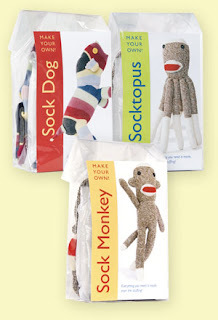 My favorite product is the Punky Monkey dolls!! I became a fan of buy green on facebook. I twittered about your giveaway! Cool deal! I would like to try the Healthy Home Starter kit. I have always wanted to go greener in the chemical area. I love this Peace Bracelet http://www.buygreen.com/peacebracelet.aspx the hemp looks like two little arms with the little hands holding onto the peace sign! Super groovy! (But that's the first thing I looked at - thanks to you (hrmph!) I'll probably be browsing there an hour!) LOL!!! I follow u on blog roll.